You submit your design, we print it on your choice of hundreds of premium cards! 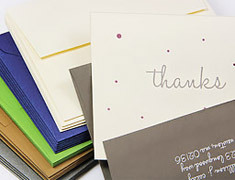 Printed card orders ship in 5 business days or less. See how our printing experts can bring your design to life. 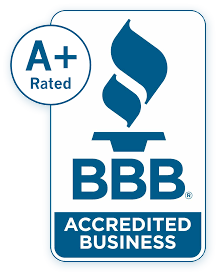 That's right, even if you ordered your envelopes from somewhere else, we can still print them for you. Just send us your envelopes, addresses, and font choice, and we'll get started! 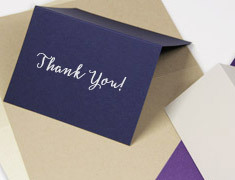 Besides cards and envelopes, we do all the little extras too. You know, name cards, belly bands, napkins, favor bags, matches... Whatever you need, we have you covered. 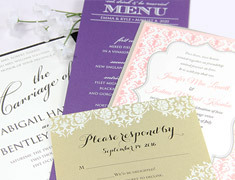 Don't stress over printing your invitation envelopes - let us do it for you! Choose from over 20 trendy fonts, or upload your own custom graphics or fonts. 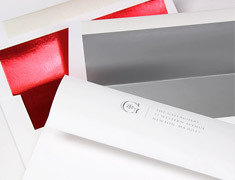 Printed envelopes ship in 5 business days or less. 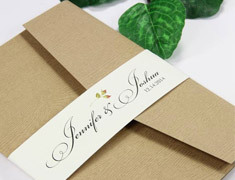 Would you like to see how envelopes will look printed? Are you toying between a few different fonts or colors? 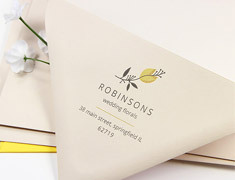 Order printed envelope samples to here to decide before you buy. 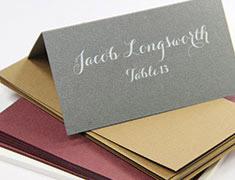 Brilliant white printing on rich, dark paper is a look that really pops! 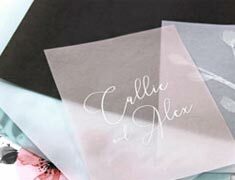 Order white printing on cards, envelopes, place cards, and more. Trust us, you're going to love this.